"It is a mass of very cold air that typically sits right on the North Pole and tends to be restricted to the North Pole by the jet stream," explained Ben Kirtman, professor of atmospheric sciences at the University of Miami Rosenstiel School of Marine and Atmospheric Science. Normally, the jet stream—which is a strong a current in the atmosphere—would keep this cold air in the Arctic, but when the jet stream wavers, or weakens, the chill can spill. "Occasionally we get meandering of the polar vortex and that is what is happening right now. And if you get a real big one you can have a big blob of cold air penetrate very far south," Kirtman told AFP. According to the Weather Channel, this week's freeze "may be the coldest in more than 20 years in parts of the Midwest and will smash dozens of daily record lows in some areas." 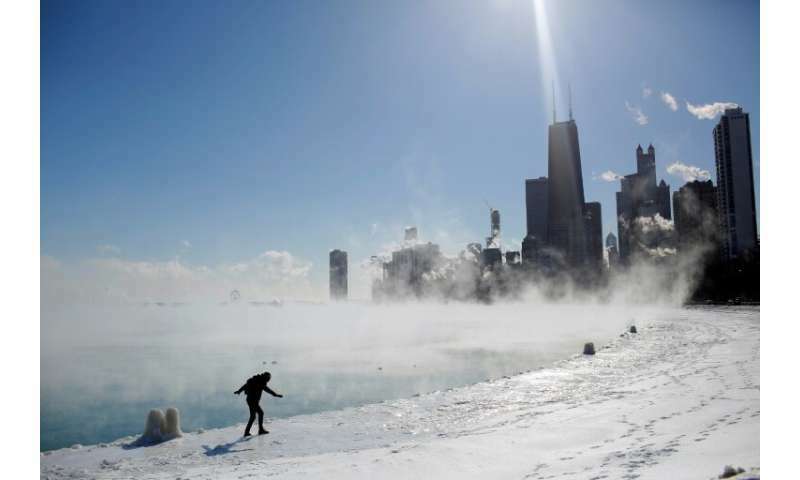 NASA's Earth Observatory said that steady northwest winds "were likely to add to the misery, causing dangerous wind chills below -40 Fahrenheit (-40 Celsius) in portions of 12 states." 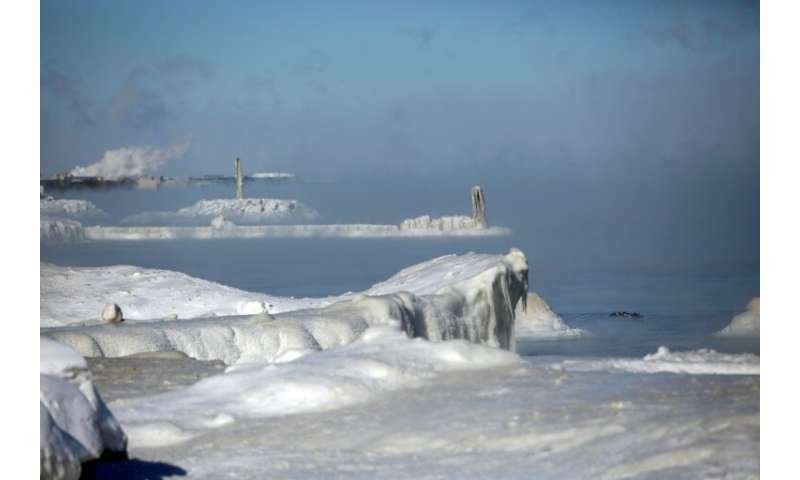 The National Weather Service warned that a wind chill of -20 F can cause frostbite in as little as 30 minutes. Why is this cold spell so strong and so vast? "It is not out of bounds with the historical record. They happen. You get storms that are bigger than other storms. There is a big part of this that is part of the natural variability of the climate," said Kirtman. The protective band in the atmosphere that typically keeps polar air in the north can and does waver. That, too, is not unexpected. "There are always undulations in the jet stream," said Kirtman. Why does the jet stream waver? The strength of the jet stream is linked to the temperature contrast between the hot tropics and the frigid poles. The starker this contrast, the stronger the jet stream, and in theory, the more likely that the polar air will stay in the Arctic. However, sometimes a jet stream that is too strong can also become unstable, "and these instabilities cause a certain amount of waviness in the jet so you can get these meanders," said Kirtman. Some evidence also suggests that when the poles heat up, there is less contrast between the tropics and the poles, and that, too, can make the jet stream become wavier, allowing cold air to spill down from the north. The Arctic is well known to be heating at twice the rate of the rest of the planet. Can this type of extreme weather be blamed on climate change? "What people are starting to ask is, if you weaken the jet stream, does that mean we are going to have more, stronger excursions of the polar vortex? If that turns out to be true, we can link more extreme cold spells to climate change," Kirtman added. Researchers are examining data in the quest to find out. "There are some hints that it is linked to climate change, but I would emphasize that the jury is still out," he said. Scientists are getting better at deciphering the role of climate change in certain weather extremes. So far, the signals are clearest in events like rainfall, drought, heatwaves and wildfires. But when it comes to cold snaps, the answers are not as clear. "I would say the science is still incomplete. We don't have proof at this point," said Kirtman. Very nicely explained how global warming can affect the cold air trapped in the Arctic spilling down to low latitudes.